Tayari Jones' 'An American Marriage' Wins Aspen Words Literary Prize The novel earned Jones the $35,000 award for tackling difficult social issues in fiction. The prize's head judge says the book is "going to have a place in the literary imagination for a long time." 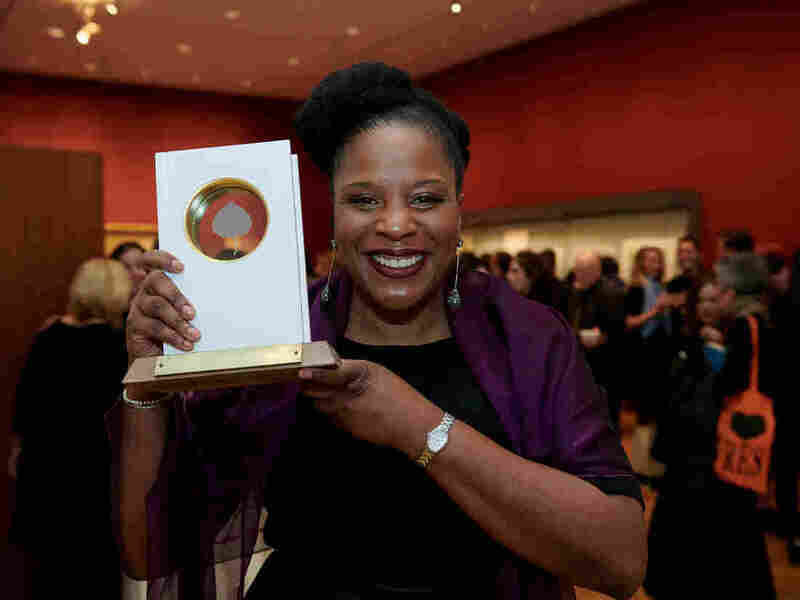 Tayari Jones holds up her Aspen Words Literary Prize, which she won Thursday in New York City for her novel An American Marriage. "It's a book for the long haul," writer Samrat Upadhyay told NPR. Upadhyay, a finalist for last year's prize, chaired this year's panel of judges. And he said that with An American Marriage, Jones managed to craft a novel that's "going to have a place in the literary imagination for a long time." The award, which the nonprofit literary organization Aspen Words doles out in partnership with NPR, offers $35,000 for an exemplary work that deploys fiction to grapple with difficult social issues. "So many of us who want to write and engage with the issues of the day, we're encouraged not to. We're told that that's not what real art does," Jones said Thursday at the Morgan Library in New York City, where she accepted the prize. "And an award like this, I think it encourages all of us to keep following the strength of our convictions." Along with Jones, four other finalists entered the ceremony Thursday at the Morgan Library in New York City with an opportunity to win: Nana Kwame Adjei-Brenyah, David Chariandy, Jennifer Clement and Tommy Orange. 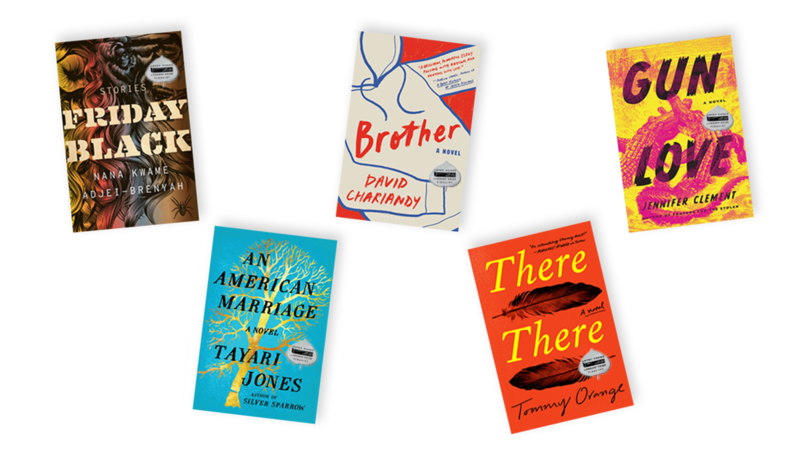 The Aspen Words Literary Prize finalists, clockwise from top left: Nana Kwame Adjei-Brenyah's Friday Black; David Chariandy's Brother; Jennifer Clement's Gun Love; Tommy Orange's There There; and Tayari Jones' An American Marriage. Before the winner was announced, the five writers — self-described by Jones as the "class of 2019" -- gathered side by side at center stage to discuss their works in detail with NPR's Renee Montagne. You can watch that conversation in full by clicking right here or just streaming the video below. Though all five writers produced "amazing books," to borrow Upadhyay's phrasing, he said there was just something about Jones' fourth novel that left the judges floored. In the book, a young African-American couple struggles to maintain love and loyalty even as the husband is locked away for a crime he didn't commit. Hanging over this love story are the pervasive effects of mass incarceration and racial discrimination. "It tackles the issue of incarceration of minorities, especially for blacks," he said. "But it's not hitting you over the head with it. It brings [the issue] to a very personal level and it talks about the damage it does to other institutions, like the institution of marriage, and to love." As Jones explained, she did not set out to make a point with her novel, necessarily: She set out simply to tell the truth, because "the point is in the truth." "Every true story is in the service of justice. You don't have to aim at justice. You just aim for the truth," Jones told NPR backstage after the event. "There's hope, and there's a satisfaction in reading a work that is substantial, that has ambition and a work that has a certain kind of — well, how do you say this? A work that wants a better future." During their conversation with Montagne, Jones' fellow finalists spoke of much the same ambition in their own fiction. Chariandy, for one, wanted to bring a spotlight to underrepresented poor immigrant communities outside Toronto in his novel Brother — and, at once, transcend the kinds of expectations that kept them pushed to the margins. "I wanted, in this book, to tell a story about the unappreciated beauty and life of that place, even when it's a story about loss and unjust circumstances," he said onstage. "For me, it was extremely important to pay homage to the beauty, creativity, resilience of young men who feel seen by people outside the communities as threats, but who are braving every day great acts of tenderness and love." #AspenLitPrize finalist Tommy Orange on hope in literature: "What I love about art is its possibility for transformation, both for the artist and the person experiencing the art." (He adds that reading Camus' THE STRANGER left him so hopeless, he fell asleep). Adjei-Brenyah, like Jones, wrestled with issues of race in his fiction, but he did so in radically different ways. His collection Friday Black deployed stories of dystopia and fantasy to, in the words of critic Lily Meyer, turn over "ideas about racism, about classism and capitalism, about the apocalypse, and, most of all, about the corrosive power of belief." On Thursday, Adjei-Brenyah noted that fiction — and his surreal twist on the form, in particular — allows him the space to tackle such a tall task. "I write the world I want. You know, if something I need for a story doesn't exist, I'll make it," he said. "This space, the premise, whatever I create, is sort of like a machine to squeeze just as much as I can out of my characters. And that squeezing, that pressure I put on them becomes the story, and hopefully something meaningful happens." "Why do I turn to fiction?" asks #AspenLitPrize finalist David Chariandy. "It's the power of the question, what if?" Orange and Clement placed similar pressures on their own characters. Orange's debut novel, There There, centers on the underrepresented lives of Native Americans who reside in cities — people, in Orange's words, who know "the sound of the freeway better than [they] do rivers." And both Clement's Gun Love brings a spotlight to bear on characters long elbowed to the margins of American society — characters confined by their class and income level and wondering whether transcending those limitations is even possible. Ultimately, along with its possibilities for change, for hope and recognition, Jones said there's something else crucial that fiction offers. "I feel that I am most myself when I am in that space of imagination. I believe in what we're talking about — that we write and try to make an impact and further conversations — but also," she said, "writing for me is a space of great pleasure. I think that sometimes gets lost, particularly with writers of color: the idea that art and literature is a site of joy and enjoyment."